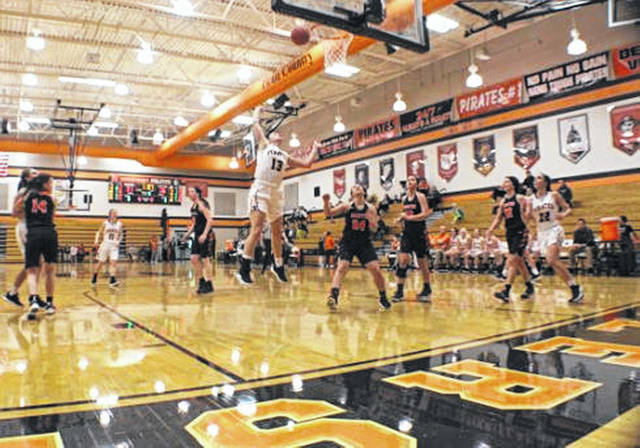 Senior Abbie Kallner attacks the rim and hits a floater in the Pirates home win over Ironton on Monday. 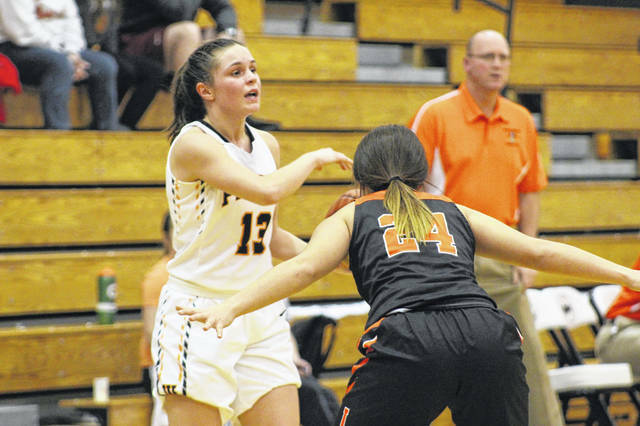 Wheelersburg sophomore Kaylee Darnell scored 16 in the Pirates home win over Ironton. Wheelersburg picked up a home non-conference win over Ironton on Monday. WHEELERSBURG – It’s not about how you start, it’s about how you finish. Such is the case with the Wheelersburg Pirates following their 53-46 non-conference win over Ironton on Monday night. The Pirates trailed after the first quarter 16-10 but went on to win the last three quarters 43-30, good enough for a seven point victory at home. Wheelersburg trailed Ironton 19-11 in the early stages of the second quarter. Yet once the Pirates found their groove offensively and settled in, it was their offensive production and strong defense that helped propel them to a home victory. Abbie Kallner had a huge game for the Pirates by scoring a game high 22 points. Kallner may have led both teams in scoring, but it was really her unselfish passing towards the end of the first half that helped the Pirates score six crucial points at the rim: four from Karlie Estep who had a big game in the post, as well as rebounding the ball, and two from Kaylee Darnell who finished with 16. Even though Darnell finished with 16, around her average for the season, the talented sophomore guard was a little displeased with her own play, Spradlin suggested. The two that signify those contributions in the most significant way? Junior Lani Irwin and sophomore Lauren Jolly. 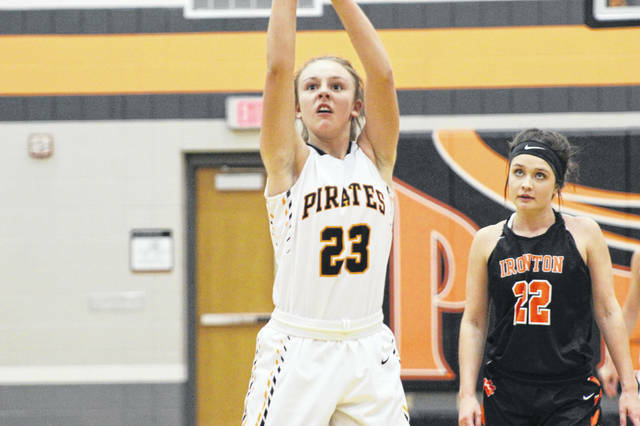 Despite combining for one point (Jolly’s banked in free throw attempt), the two made hustle play after hustle play that really helped the Pirates bolster a seven point home win over Ironton. It hasn’t been the easiest stretch of games since the start of the new year for the Pirates, and it doesn’t get any easier from here. After road games at Minford and Vinton County, as well as home games against Oak Hill and Ironton, the Pirates will be preparing for another three game week with contests against Northwest and South Point on Thursday and Saturday.